December 21, 1891; 127 years ago (1891-12-21). Springfield, Massachusetts, U.S.
Basketball is a team sport in which two teams, most commonly of five players each, opposing one another on a rectangular court, compete with the primary objective of shooting a basketball (approximately 9.4 inches (24 cm) in diameter) through the defender's hoop (a basket 18 inches (46 cm) in diameter mounted 10 feet (3.048 m) high to a backboard at each end of the court) while preventing the opposing team from shooting through their own hoop. A field goal is worth two points, unless made from behind the three-point line, when it is worth three. 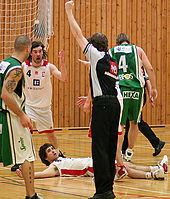 After a foul, timed play stops and the player fouled or designated to shoot a technical foul is given one or more one-point free throws. The team with the most points at the end of the game wins, but if regulation play expires with the score tied, an additional period of play (overtime) is mandated. 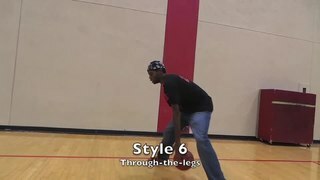 Players advance the ball by bouncing it while walking or running (dribbling) or by passing it to a teammate, both of which require considerable skill. On offense, players may use a variety of shots—the lay-up, the jump shot, or a dunk; on defense, they may steal the ball from a dribbler, intercept passes, or block shots; either offense or defense may collect a rebound, that is, a missed shot that bounces from rim or backboard. 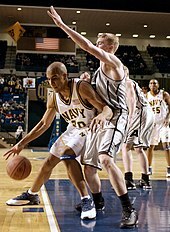 It is a violation to lift or drag one's pivot foot without dribbling the ball, to carry it, or to hold the ball with both hands then resume dribbling. 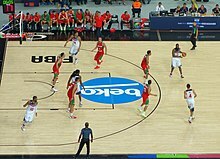 The five players on each side at a time fall into five playing positions: the tallest player is usually the center, the tallest and strongest is the power forward, a slightly shorter but more agile big man is the small forward, and the shortest players or the best ball handlers are the shooting guard and the point guard, who implements the coach's game plan by managing the execution of offensive and defensive plays (player positioning). 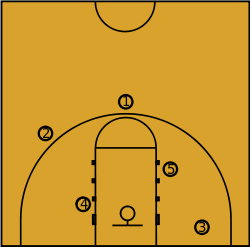 Informally, players may play three-on-three, two-on-two, and one-on-one. Invented in 1891 by Canadian-American gym teacher James Naismith in Springfield, Massachusetts, United States, basketball has evolved to become one of the world's most popular and widely viewed sports. The National Basketball Association (NBA) is the most significant professional basketball league in the world in terms of popularity, salaries, talent, and level of competition. Outside North America, the top clubs from national leagues qualify to continental championships such as the Euroleague and FIBA Americas League. The FIBA Basketball World Cup and Men's Olympic Basketball Tournament are the major international events of the sport and attract top national teams from around the world. Each continent hosts regional competitions for national teams, like EuroBasket and FIBA AmeriCup. In early December 1891, Canadian James Naismith, a physical education professor and instructor at the International Young Men's Christian Association Training School (YMCA) (today, Springfield College) in Springfield, Massachusetts, was trying to keep his gym class active on a rainy day. He sought a vigorous indoor game to keep his students occupied and at proper levels of fitness during the long New England winters. After rejecting other ideas as either too rough or poorly suited to walled-in gymnasiums, he wrote the basic rules and nailed a peach basket onto a 10-foot (3.0 m) elevated track. In contrast with modern basketball nets, this peach basket retained its bottom, and balls had to be retrieved manually after each "basket" or point scored; this proved inefficient, however, so the bottom of the basket was removed, allowing the balls to be poked out with a long dowel each time. Basketball was originally played with a soccer ball. 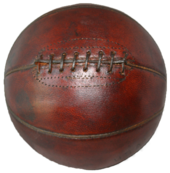 These round balls from "association football" were made, at the time, with a set of laces to close off the hole needed for inserting the inflatable bladder after the other sewn-together segments of the ball's cover had been flipped outside-in. These laces could cause bounce passes and dribbling to be unpredictable. Eventually a lace-free ball construction method was invented, and this change to the game was endorsed by Naismith. (Whereas in American football, the lace construction proved to be advantageous for gripping and remains to this day.) The first balls made specifically for basketball were brown, and it was only in the late 1950s that Tony Hinkle, searching for a ball that would be more visible to players and spectators alike, introduced the orange ball that is now in common use. Dribbling was not part of the original game except for the "bounce pass" to teammates. Passing the ball was the primary means of ball movement. Dribbling was eventually introduced but limited by the asymmetric shape of early balls. [dubious – discuss] Dribbling was common by 1896, with a rule against the double dribble by 1898. 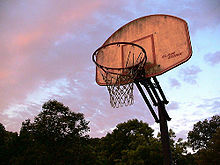 The peach baskets were used until 1906 when they were finally replaced by metal hoops with backboards. A further change was soon made, so the ball merely passed through. Whenever a person got the ball in the basket, his team would gain a point. Whichever team got the most points won the game. The baskets were originally nailed to the mezzanine balcony of the playing court, but this proved impractical when spectators in the balcony began to interfere with shots. The backboard was introduced to prevent this interference; it had the additional effect of allowing rebound shots. Naismith's handwritten diaries, discovered by his granddaughter in early 2006, indicate that he was nervous about the new game he had invented, which incorporated rules from a children's game called duck on a rock, as many had failed before it. 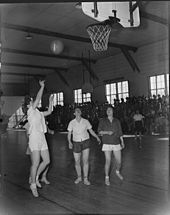 Basketball's early adherents were dispatched to YMCAs throughout the United States, and it quickly spread through the United States and Canada. By 1895, it was well established at several women's high schools. While the YMCA was responsible for initially developing and spreading the game, within a decade it discouraged the new sport, as rough play and rowdy crowds began to detract from the YMCA's primary mission. However, other amateur sports clubs, colleges, and professional clubs quickly filled the void. 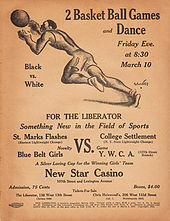 In the years before World War I, the Amateur Athletic Union and the Intercollegiate Athletic Association of the United States (forerunner of the NCAA) vied for control over the rules for the game. The first pro league, the National Basketball League, was formed in 1898 to protect players from exploitation and to promote a less rough game. This league only lasted five years. James Naismith was instrumental in establishing college basketball. His colleague C.O. Beamis fielded the first college basketball team just a year after the Springfield YMCA game at the suburban Pittsburgh Geneva College. Naismith himself later coached at the University of Kansas for six years, before handing the reins to renowned coach Forrest "Phog" Allen. Naismith's disciple Amos Alonzo Stagg brought basketball to the University of Chicago, while Adolph Rupp, a student of Naismith's at Kansas, enjoyed great success as coach at the University of Kentucky. 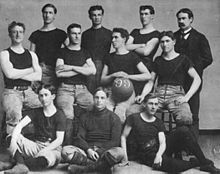 On February 9, 1895, the first intercollegiate 5-on-5 game was played at Hamline University between Hamline and the School of Agriculture, which was affiliated with the University of Minnesota. The School of Agriculture won in a 9–3 game. In 1901, colleges, including the University of Chicago, Columbia University, Cornell University, Dartmouth College, the University of Minnesota, the U.S. 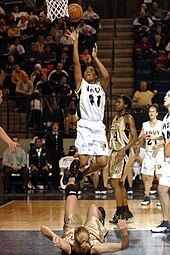 Naval Academy, the University of Colorado and Yale University began sponsoring men's games. In 1905, frequent injuries on the football field prompted President Theodore Roosevelt to suggest that colleges form a governing body, resulting in the creation of the Intercollegiate Athletic Association of the United States (IAAUS). In 1910, that body would change its name to the National Collegiate Athletic Association (NCAA). The first Canadian interuniversity basketball game was played at the YMCA in Kingston, Ontario on February 6, 1904, when McGill University—Naismith's alma mater—visited Queen's University. McGill won 9–7 in overtime; the score was 7–7 at the end of regulation play, and a ten-minute overtime period settled the outcome. A good turnout of spectators watched the game. Today virtually every high school in the United States fields a basketball team in varsity competition. Basketball's popularity remains high, both in rural areas where they carry the identification of the entire community, as well as at some larger schools known for their basketball teams where many players go on to participate at higher levels of competition after graduation. In the 2016–17 season, 980,673 boys and girls represented their schools in interscholastic basketball competition, according to the National Federation of State High School Associations. The states of Illinois, Indiana and Kentucky are particularly well known for their residents' devotion to high school basketball, commonly called Hoosier Hysteria in Indiana; the critically acclaimed film Hoosiers shows high school basketball's depth of meaning to these communities. In 1946, the Basketball Association of America (BAA) was formed. The first game was played in Toronto, Ontario, Canada between the Toronto Huskies and New York Knickerbockers on November 1, 1946. Three seasons later, in 1949, the BAA merged with the National Basketball League (NBL) to form the National Basketball Association (NBA). By the 1950s, basketball had become a major college sport, thus paving the way for a growth of interest in professional basketball. In 1959, a basketball hall of fame was founded in Springfield, Massachusetts, site of the first game. Its rosters include the names of great players, coaches, referees and people who have contributed significantly to the development of the game. The hall of fame has people who have accomplished many goals in their career in basketball. An upstart organization, the American Basketball Association, emerged in 1967 and briefly threatened the NBA's dominance until the ABA-NBA merger in 1976. Today the NBA is the top professional basketball league in the world in terms of popularity, salaries, talent, and level of competition. In 2001, the NBA formed a developmental league, the National Basketball Development League (later known as the NBA D-League and then the NBA G League after a branding deal with Gatorade). As of the 2018–19 season, the G League has 27 teams. In 1989, FIBA allowed professional NBA players to participate in the Olympics for the first time. Prior to the 1992 Summer Olympics, only European and South American teams were allowed to field professionals in the Olympics. The United States' dominance continued with the introduction of the original Dream Team. 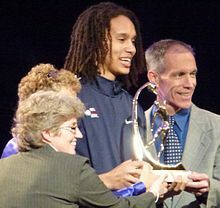 In the 2004 Athens Olympics, the United States suffered its first Olympic loss while using professional players, falling to Puerto Rico (in a 19-point loss) and Lithuania in group games, and being eliminated in the semifinals by Argentina. 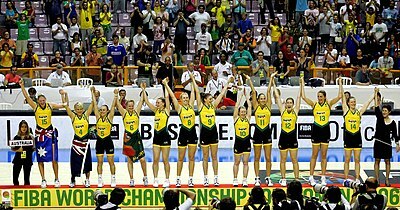 It eventually won the bronze medal defeating Lithuania, finishing behind Argentina and Italy. The Redeem Team, won gold at the 2008 Olympics, and the B-Team, won gold at the 2010 FIBA World Championship in Turkey despite featuring no players from the 2008 squad. The United States continued its dominance as they won gold at the 2012 Olympics, 2014 FIBA World Cup and the 2016 Olympics. End of a match as the shotclock shows no time left. 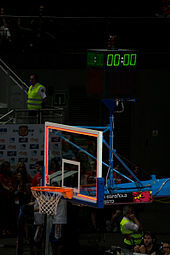 Games are played in four quarters of 10 (FIBA) or 12 minutes (NBA). College men's games use two 20-minute halves, college women's games use 10-minute quarters, and most United States high school varsity games use 8-minute quarters; however, this varies from state to state. 15 minutes are allowed for a half-time break under FIBA, NBA, and NCAA rules and 10 minutes in United States high schools. Overtime periods are five minutes in length except for high school, which is four minutes in length. Teams exchange baskets for the second half. The time allowed is actual playing time; the clock is stopped while the play is not active. Therefore, games generally take much longer to complete than the allotted game time, typically about two hours. There is a second category of fouls called technical fouls, which may be charged for various rules violations including failure to properly record a player in the scorebook, or for unsportsmanlike conduct. These infractions result in one or two free throws, which may be taken by any of the five players on the court at the time. Repeated incidents can result in disqualification. A blatant foul involving physical contact that is either excessive or unnecessary is called an intentional foul (flagrant foul in the NBA). In FIBA and NCAA women's basketball, a foul resulting in ejection is called a disqualifying foul, while in leagues other than the NBA, such a foul is referred to as flagrant. 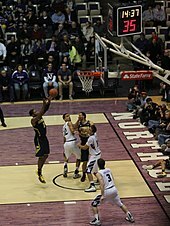 Players regularly inflate their height. Many prospects exaggerate their height while in high school or college to make themselves more appealing to coaches and scouts, who prefer taller players. Charles Barkley stated; "I've been measured at 6-5, 6-4 ​3⁄4. But I started in college at 6-6." Sam Smith, former writer from The Chicago Tribune, said: "We sort of know the heights, because after camp, the sheet comes out. But you use that height, and the player gets mad. And then you hear from his agent. Or you file your story with the right height, and the copy desk changes it because they have the 'official' N.B.A. media guide, which is wrong. So you sort of go along with the joke." In the NBA, there is no standard on whether a player's listed height uses their measurement with shoes on or without. The NBA Draft Combine, which most players attend before the draft, provides both measurements. Thereafter, a player's team is solely responsible for their listed height, which can vary depending on the process selected. On rare occasions, some players will understate their actual heights, not to be repositioned. One example is Kevin Durant, who's listed height 6 feet 9 inches (2.06 m), while his actual height is 7 feet 0 inches (2.13 m). Durants' reasoning was, "Really, that's the prototypical size for a small forward. Anything taller than that, and they'll start saying, 'Ah, he's a power forward." The first non-white player entered the league in 1947. Wataru Misaka debuted in 1947–48 as the first non-white player and the first player of Asian descent to play in the league. Yao Ming became the first East Asian first overall pick, when he was selected by the Houston Rockets in the 2002 NBA draft. In 2011, Richard Lapchick with The Institute for Diversity and Ethics in Sport (TIDES) of the University of Central Florida reported in their annual Racial and Gender Report Card that 17 percent of the league's players were white, the lowest since the report began in 1990. [a] Hall of Fame player and Indiana Pacers president of basketball operations Larry Bird, who is white, stated in 2004 that the league needed more white players since the league's fans are mostly white. "And if you just had a couple of white guys in there, you might get them [the fans, not the guys] a little excited. But it is a black man's game, and it will be forever. I mean, the greatest athletes in the world are African-American," said Bird. More recently, a number of commentators have remarked on the league's dwindling number of white American players. While a TIDES study found that the NBA was 18.3% white in the 2015–16 season, this number also included non-Americans, most notably Europeans. During the entire 1996–97 season, only three NBA teams did not field an American-born white; on the opening day of the 2016–17 season, eight teams did not have a white American on their roster, and an additional 10 teams had only one. At the latter point in time, fewer than 10% of NBA players were American-born whites (43 out of a possible 450). These proportions have been suggested to be the result of basketball's relatively minor importance in white American culture. As of 2014[update], white interest in the NBA remains the lowest among all racial groups, with African Americans and Asian Americans spending the most time watching basketball, followed by Hispanics (of any race). Furthermore, according to a Nielsen's survey, the NBA has the highest share of black viewers, with 45 percent of its viewers being black and only about 40 percent of viewers being white, making it the only top North American sport that doesn't have a white majority audience. The NBAs popularity further declined among whites, who during the 2016-17 season, only made up 34% of the overall viewership. At the same time the black viewership increased to 47 percent, while hispanic (of any race) stood at 11 percent and asian viewership stood at eight percent. Half-court basketball is usually played 1-on-1, 2-on-2 or 3-on-3. The latter variation is gradually gaining official recognition as 3x3, originally known as FIBA 33. It was first tested at the 2007 Asian Indoor Games in Macau and the first official tournaments were held at the 2009 Asian Youth Games and the 2010 Youth Olympics, both in Singapore. The first FIBA 3x3 Youth World Championships were held in Rimini, Italy in 2011, with the first FIBA 3x3 World Championships for senior teams following a year later in Athens. The sport is highly tipped to become an Olympic sport as early as 2016. In the summer of 2017, the BIG3 basketball league, a professional 3x3 half court basketball league that features former NBA players, began. The BIG3 features several rule variants including a four-point field goal. 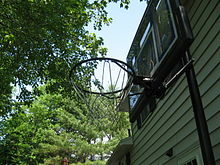 A modified version of basketball, played on beaches, was invented by Philip Bryant. Beach basketball is played in a circular court with no backboard on the goal, no out-of-bounds rule with the ball movement to be done via passes or 21/2 steps, as dribbling is next to impossible on a soft surface. ^ Lapchick began the reports, known previously as the Racial Report Card, while with the Center for the Study of Sport in Society at Northeastern University. ^ Griffiths, Sian (September 20, 2010). "The Canadian who invented basketball". BBC News. Retrieved September 14, 2011. ^ "The Surge of the NBA's International Viewership and Popularity". Forbes.com. June 14, 2012. Retrieved June 14, 2012. ^ "The Greatest Canadian Invention". CBC News. Archived from the original on December 3, 2010. ^ "YMCA International - World Alliance of YMCAs: Basketball : a YMCA Invention". www.ymca.int. Archived from the original on March 14, 2016. Retrieved March 22, 2016. 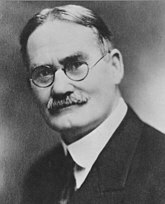 ^ FAQs.org, James A. Naismith. Retrieved February 24, 2010. ^ Jeep (July 16, 2012). "Passion Drives Creation - Jeep® & USA Basketball" – via YouTube. 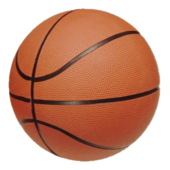 ^ Inflatable ball, Inventor: Frank Dieterle, Patent: US 1660378 A (1928) The description in this patent explains problems caused by lacing on the cover of basketballs. ^ Naismith, James (1941). Basketball : its origin and development. New York: Association Press. ^ "James Naismith Biography". February 14, 2007. Archived from the original on February 5, 2007. Retrieved February 14, 2007. ^ Thinkquest, Basketball. Retrieved January 20, 2009. ^ "Error 404 - Olympic.org". June 26, 2010. Archived from the original on June 26, 2010. ^ "Newly found documents shed light on basketball's birth". ESPN. Associated Press. November 13, 2006. Archived from the original on December 1, 2007. Retrieved January 11, 2007. ^ Fuoco, Linda (April 15, 2010). "Grandson of basketball's inventor brings game's exhibit to Geneva College". Postgazette.com. Retrieved June 3, 2011. ^ "Hamline University Athletics: Hutton Arena". Hamline.edu. January 4, 1937. Archived from the original on May 28, 2010. Retrieved July 25, 2010. 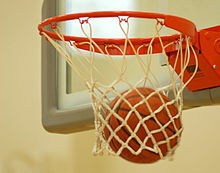 ^ "1st Ever Public Basketball Game Played..." www.rarenewspapers.com. 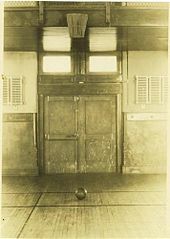 ^ "1st Ever Public Basketball Game Played". Rare & Early Newspapers. March 12, 1892. Retrieved March 22, 2016. ^ Queen's Journal, vol. 31, no. 7, February 16, 1904; 105 years of Canadian university basketball, by Earl Zukerman, "broken link". Archived from the original on October 1, 2018. Retrieved February 6, 2009. ^ 2008–09 High School Athletics Participation Survey NFHS. ^ "2016–17 High School Athletics Participation Survey" (PDF). National Federation of State High School Associations. Retrieved February 16, 2018. ^ "National Interscholastic Basketball Tournament – hoopedeia.nba.com – Retrieved September 13, 2009". Hoopedia.nba.com. Archived from the original on August 10, 2010. Retrieved July 25, 2010. ^ "National Catholic Interscholastic Basketball Tournament, 1924–1941 – hoopedia.nba.com – Retrieved September 13, 2009". Hoopedia.nba.com. December 7, 1941. Archived from the original on August 10, 2010. Retrieved July 25, 2010. ^ "National Catholic Invitations Basketball Tournament – hoopedia.nba.com – Retrieved September 13, 2009". Hoopedia.nba.com. Archived from the original on August 10, 2010. Retrieved July 25, 2010. ^ "– National Interscholastic Basketball Tournament for Black High Schools, 1929–1942 – Retrieved September 13, 2009". Hoopedia.nba.com. Archived from the original on August 10, 2010. Retrieved July 25, 2010. ^ "National Invitational Interscholastic Basketball Tournament – hoopedia.nba.com – Retrieved September 13, 2009". Hoopedia.nba.com. Archived from the original on August 10, 2010. Retrieved July 25, 2010. ^ Golden, Daniel (July 23, 2012). "Three Seconds at 1972 Olympics Haunt U.S. Basketball". Bloomberg Business Week. Retrieved November 18, 2014. ^ "Pioneers in Physical Education". pp. 661–662. Archived from the original on June 20, 2009. Retrieved June 3, 2009. ^ a b "Senda Berenson Papers". Archived from the original on February 3, 2016. Retrieved June 3, 2009. ^ Jenkins, Sally. "History of Women's Basketball". WNBA.com. Archived from the original on January 6, 2013. Retrieved January 21, 2014. ^ Peacock-Broyles, Trinity. "You Come in as a Squirrel and Leave as an Owl". Smith.edu. Archived from the original on June 15, 2011. Retrieved June 3, 2011. ^ a b c d "Historical Timeline". Archived from the original on June 21, 2009. Retrieved June 2, 2009. ^ "The Great Teams". Archived from the original on August 12, 2010. Retrieved June 2, 2009. ^ a b "Official Rules of the National Basketball Association 2013-2014" (PDF). pp. 8–9. ^ NBA Official Rules (2009–2010) Rule 5, Section II, a. Retrieved July 26, 2010. 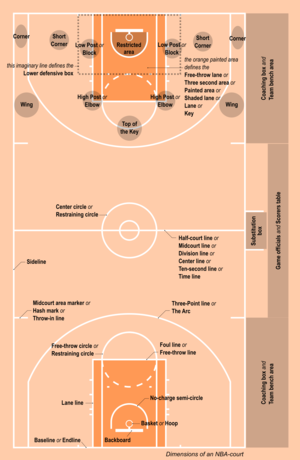 ^ a b c 2009–2011 Men's & Women's Basketball Rules Rule 5, Section 6, Article 1. Retrieved July 26, 2010. ^ "NCAA panel approves women's basketball rules changes". ESPN.com. Associated Press. June 8, 2015. Retrieved June 9, 2015. ^ Stewart, Mark (June 25, 2015). "Varsity basketball games will have two 18-minute halves next season". Journal Sentinel. Retrieved July 11, 2018. ^ NBA Official Rules (2009–2010) Rule 5, Section II, c. Retrieved July 26, 2010. ^ NBA Official Rules (2009–2010) Rule 5, Section II, b. Retrieved July 26, 2010. ^ NBA Official Rules (2009–2010) Rule 3, Section I, a. Retrieved July 26, 2010. ^ 2009–2011 Men's & Women's Basketball Rules Rule 10, Section 2, Article 6. Retrieved July 26, 2010. ^ Lynch, William. "What Are the Different Types of Basketball Court Surfaces?". ^ "What Are the Different Types of Basketball Court Surfaces?". LIVESTRONG. February 7, 2014. Retrieved March 22, 2016. ^ "Wilson to provide the Official Game Ball for FIBA" (Press release). Amer Sports. June 9, 2015. Retrieved August 17, 2015. ^ Marshall, John (November 1, 2014). "Positionless basketball taking hold in college". Retrieved November 18, 2014. ^ "Muggsy Bogues Bio". NBA.com. Archived from the original on July 17, 2010. Retrieved July 25, 2010. ^ a b Noah Liberman (June 22, 2008). "When Height Becomes a Tall Tale". The New York Times. Retrieved February 1, 2019. ^ Sherwood Strauss, Ethan (December 29, 2011). "Kevin Love and height liars in shoes". ESPN.com. Archived from the original on February 10, 2015. ^ Goffinet, Larry (January 25, 2015). "Shoes shouldn't count in measuring height". Perry County News. Archived from the original on February 10, 2015. Retrieved September 1, 2018. ^ a b Vecsey, George (February 15, 2012). "The Old Guard Welcomes the New Guard". The New York Times. p. B10. Archived from the original on February 22, 2012. ^ a b Lapchick, Richard; Aristeguieta, Francisco; Clark, Wayne; Cloud, Christina; Florzak, Anna; Frazier, Demetrius; Kuhn, Michael; Record, Tavia; Vinson, Matthew (June 16, 2011). "The 2011 Racial and Gender Report Card: National Basketball Association". The Institute for Diversity and Ethics in Sport. Archived from the original on December 7, 2015. Retrieved December 7, 2015. ^ "Richard Lapchick, Director of the DeVos Sport Business Management Program". University of Central Florida. Archived from the original on December 7, 2015. Retrieved December 7, 2015. ^ "Study: 2011 NBA Racial and Gender Report Card". SlamOnline.com. Source Interlink Magazines. June 16, 2011. Archived from the original on February 22, 2012. Retrieved June 20, 2015. ^ Celzic, Mike. "Race has nothing to do with NBA's success". NBCSports.com. Archived from the original on February 22, 2012. Retrieved June 20, 2015. ^ Kuhn, David Paul (2007). The Neglected Voter: White Men and the Democratic Dilemma. Macmillan. p. 205. ISBN 9781403982742. Retrieved February 16, 2014. ^ Spears, Marc J. (October 25, 2016). "Where Are All the White American NBA Players?". The Undefeated. Retrieved March 20, 2017. ^ "2011 3x3 Youth World Championship | FIBA.COM". Rimini2011.fiba.com. September 11, 2011. Archived from the original on November 13, 2012. Retrieved November 22, 2012. ^ "3-on-3 basketball might become big time?". ESPN. Retrieved January 11, 2011. ^ "Big3 begins: Ice Cube's new 3-on-3 league starts with a bang". ^ Eric Shanburn (2008). Basketball and Baseball Games: For the Driveway, Field Or the Alleyway. AuthorHouse. ISBN 978-1-4343-8912-1. Retrieved June 29, 2010. 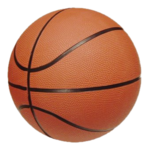 ^ "Learn Basketball on FindSportsNow". Findsportsnow.com. November 5, 2007. Retrieved July 25, 2010. ^ IWBF. "IWBF website". Iwbf.org. Retrieved July 25, 2010. ^ "World Beach Basketball site". Beachbasketball.com. May 5, 1995. Archived from the original on August 9, 2010. Retrieved July 25, 2010. ^ "Bankshot basketball website". Bankshot.com. Retrieved July 25, 2010. National Basketball Association (2014). "Official Rules of the National Basketball Association" (PDF). Retrieved March 6, 2015.
International Basketball Federation (June 2004). Official Basketball Rules. Archived from the original on December 22, 2005. Bonsor, Kevin. "How Basketball Works: Who's Who". HowStuffWorks. Archived from the original on January 1, 2006. Retrieved January 11, 2006.